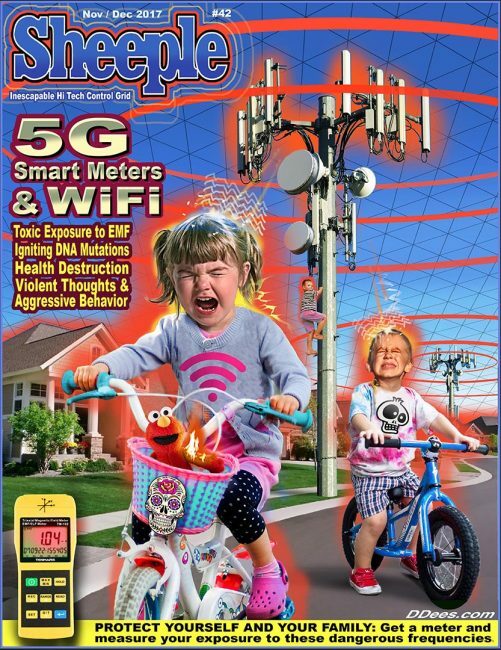 No “safe” level of cell phone and wireless WiFi radiation exposure has been scientifically determined for children or pregnant women. Despite this, many millions of American taxpayer dollars have been spent making public schools “high tech” while tech inventors have been limiting their own kids’ use and sending them to private “low tech” schools. If your children are having any type of behavioral, emotional, mental or physical health issues, lab testing may determine if some or all of this is because of “Microwave Sickness” aka “ElectroSensitivity” (ES). There are so many symptoms that this it’s often misdiagnosed. This website is for parents and teachers seeking WiFi-Free schools. In 2011, The World Health Organization classified all sources of wireless WiFi radiation as a “Possible Carcinogen”. Many scientists believe it should be classified as a Carcinogen. Outline: National Endowment for Democracy an NGO controlled by the CIA; Reagan Administration guarantees Soviets no movement of NATO eastward in return for peaceful reunification of Germany under NATO; top secret CONPLAN 8022 global strike capability activated June 2004 by Rumsfeld; fake NED and NGO democracy apparatus orchestrates both the Ukraine Orange Color Revolution of 2004 and the Georgian Rose Revolution; Soros Foundation deeply involved in both Ukrainian color revolutions; 2018 Armenian Revolution follows the fake democracy script; US economic sanctions on Russian oligarchs; Trump administration abrogation of 2015 nuclear treaty with Iran and European reaction; EU activation of 1996 Blocking Statute symbolic; US secondary sanctions effective; US Treasury becomes a central component of national intelligence council; Secretary of State Pompeo’s twelve draconian conditions for Iran constitute economic warfare on that country; Netanyahu meets Putin on May 9th for talks on future of Syria and Iran; Russia limits its involvement in Syria; continuity of Trump Administration geopolitics; three Eurasian powers – Russia, China and Iran – systematically targeted a la Paul Wolfowitz’s Defense Planning Guidance and Zbigniew Brzezinski’s The Grand Chessboard; US trade war with China; Made in China 2025 policy to replace China 2035 co-written by Robert Zoellick and the World Bank; hyper-instability of global geopolitical situation. Note from the ultra-wealthy to the peasants: please die or become slaves, ok? We’re very concerned about the earth. That’s why we invest in genetic vandalism, industrial pollution and war. The world’s ruling elite will meet in secret this week. No press will be allowed in, no one will be interviewed about it, and Bilderberg will barely register as a blip within the mainstream media’s radar. As the media hypes the mostly symbolic meeting between Donald Trump and Kim Jong-un, bankers, politicians, military leaders, and information controllers will be discussing their plans for the world behind closed doors and with zero transparency…. In what some call a violation of the United States Logan Act, the governor of Colorado, John Hickenlooper will be in attendance. His invite is likely strategic as he is already rumored to run for president in 2020…. None of the above crimes would have been possible without the active complicity and duplicity of the self-described “free press”. California is getting a clue and moving to create a state chartered bank to allow pot growers to bypass the massively rapacious, abusive and oppressive organized crime syndicate called the “federal reserve” banking system. But why restrict it to pot growers and why remain in the dollar system at all? The “fed” is quite deliberately sinking the dollar and expecting the clueless peasants to go down with the ship so the western aristocracy can steal every last bit of real wealth out from under us, finishing the job they started with the great ripoff of the 1930’s. And their plans will definitely come to fruition if americans insist on using their discredited federal reserve notes while they flood in by the trainload as the rest of the world bails out of it. The time is now for states to assert their 10th amendment powers and create a non-fed currency and banking system for the sake of the physical survival of their people. Last week, the California Senate passed a bill that would establish limited state-chartered banks to serve the cannabis industry. Final passage of this legislation would remove a major federal roadblock in front of the developing marijuana industry in the state and further nullify federal prohibition of cannabis. Sen. Bob Hertzberg, (D-Van Nuys), along with a bipartisan coalition of nine cosponsors, introduced Senate Bill 930 (SB930) in January. The legislation would create a self-contained banking system for the cannabis industry in California. Because marijuana remains illegal under federal law, cannabis businesses in states that have legalized marijuana remain effectively locked out of the banking system. If a federally chartered or insured financial institution touches marijuana money, it takes on significant legal risk. The federal government insures or charters virtually every bank in the U.S. As a result, cannabis businesses have been forced to transact almost exclusively in cash. Passage of SB930 would completely bypass the federal banking system and create a limited banking alternative for the marijuana industry in California. Under the proposed law, the state would license “cannabis limited charter banks and credit unions.” Cannabis businesses would be able to deposit funds in these institutions and write checks on their accounts for limited purposes, including paying state or local fees and taxes, rent on property associated with a cannabis business, paying vendors, or buying state or local bonds or warrants. These checks could only be deposited or cashed at the issuing cannabis limited charter bank or credit union, or another cannabis limited charter bank or credit union that agrees to accept the check, keeping them outside of the federal checking system known as the automatic clearing house (ACH)…. The Federal Reserve has gotten into the act, denying its services to state banks chartered to serve the marijuana industry….